The Staten Island Pizza Rats ball caps. So long Staten Island Yankees, hello Staten Island Pizza Rats -- for a few nights, anyway. The minor league team announced Monday that the team will be adopting the moniker of New York City's famous pizza-loving rodent for five games in June, July and August. It comes after the Class A New York Yankees farm team held a fan vote in 2016 to change the name of the squad in a fan vote. The Pizza Rat -- not far from the height of its viral fame -- knocked off all other comers, including the Bridge Trolls, Island Heroes, Killer Bees and Rock Pigeons. But the team opted to keep the moniker it shared with its big league brother, citing rebranding timelines. 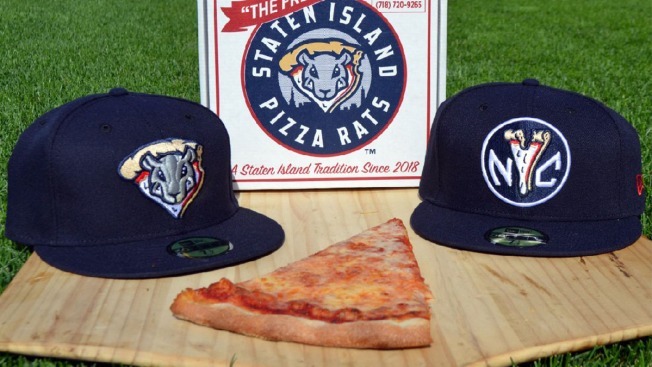 The team will become the Pizza Rats for every Saturday home game (June 23, July 7, 14 and 21; and Aug. 4) and will even don custom uniforms and ball caps for the occasion. Fans can also buy Pizza Rat-branded caps, shirts and other merchandise for each of the games. It's not the first time a team in the tri-state has made a whimsical name change this season: the Trenton Thunder have been playing as the Trenton Pork Roll every Friday night all season in honor of the Garden State's favorite processed meat.